Rallies and vigils next week in Albany, New Paltz and Kingston will mark the second anniversary of the Lac Megantic disaster, in which a runaway oil train derailed and exploded in a small Quebec town, killing 47 people and destroying the town center. In Albany, People of Albany United for Safe Energy will rally in front of the Governor's Mansion on Eagle Street at noon Monday to mark the second anniversary. In Kingston, a march and vigil from 5 to 6 p.m. Monday will start at Kingston City Hall, with participants walking to the railroad bridge over Broadway, and then returning to City Hall at 5:45 p.m., where they will read the names of those killed at Lac Megantic. In New Paltz, a "Vigil to Stop the Oil Trains and Pilgrim Pipelines" will be held from 4 to 6 p.m. Monday on Main Street in front of the Elting Library. Next Thursday, a public forum on what's described as a quadruple threat of oil trains, barges, and the two proposed Pilgrim pipelines will be held from 6:30 p.m. to 8:30 p.m. at Kingston City Hall. The forum is being organized by the Coalition Against Pilgrim Pipelines — New York. Speakers include local elected officials as well as Kate Hudson of Riverkeeper, and Chris Amato of Earthjustice. 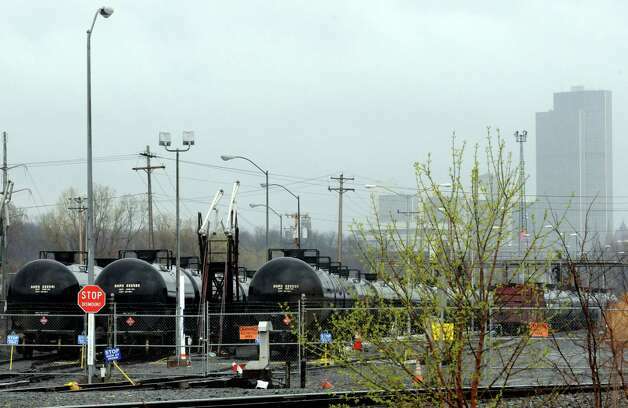 The Port of Albany has become a major transshipment point for Bakken crude from North Dakota, which in the wake of the July 6, 2013 Lac Megantic disaster was found to be more flammable than traditional crude. CSX and Canadian Pacific trains deliver Bakken crude to Albany terminals operated by Buckeye Partners of Houston and Global Partners of Waltham, Mass. It is then transferred to barges or tankers for shipment down the Hudson River to refineries on the East Coast and in Canada. PAUSE, which is organizing the Albany rally, said it wants Gov. Andrew Cuomo to use the state's authority to stop the trains, saying Albany risks a similar tragedy. State officials have said the federal government has the authority to regulate railroad operations.